The Ontario government released its latest Long-Term Energy Plan (LTEP), Delivering Fairness and Choice, on October 26, 2017. While the updated LTEP is agnostic with respect to future electricity supply options, it is hard to imagine a scenario where wind energy will not continue to play a major role. At the heart of the Long-Term Energy Plan is a supply and demand outlook that shows the need for significant new electricity generation, especially from 2023 onwards as the 3,100 megawatt Pickering Nuclear station shuts down, other nuclear units are being refurbished, and generation contracts reach end of life. Figure 8, page 37 of Ontario’s Long-Term Energy Plan. There are significant risks that the province must manage to ensure reliable electricity supply going forward. For example, what if the refurbishment of 10 nuclear reactors at the Darlington and Bruce nuclear stations goes well over budget and/or schedule? What if electricity generation isn’t repowered or replaced as current contracts expire? What if energy efficiency falls short? Or what if demand rises more than expected as Ontario’s population continues to grow and electricity becomes the fuel of choice in an increasingly de-carbonized economy? How would the province respond? New nuclear, which takes a decade or more to build, has large cost risks. There is very little new hydro-electric power that can be developed at a low cost. Large-scale hydro imports could be expensive, and natural gas (according to the LTEP) is likely to be constrained for both economic (increasing cap and trade charges) and climate change reasons. The province is considering capacity auctions to procure new supply going forward. To the extent that the auctions seek firm supply, they will be more likely to incent natural gas generation than renewables like wind energy. Our position is that Ontario’s Independent Electricity System Operator should also consider using competitive procurements for long-term contracts to secure the lowest-cost, non-emitting electricity generation. That’s what happened in 2014, when a competitive procurement for wind energy resulted in an average 20-year price of 8.45 cents per kilowatt hour, with one contract as low as 6.45 cents – all well below the average cost of generation at that time. 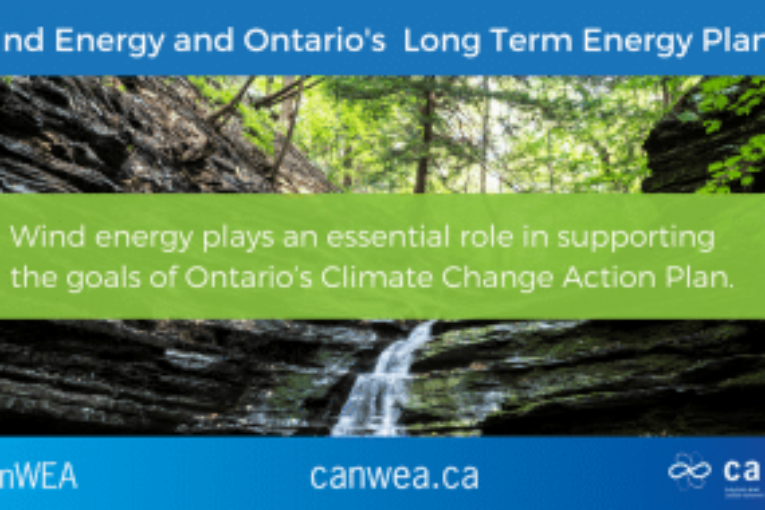 Ontario’s updated LTEP foresees a future supply of electricity that is reliable, affordable, clean, and that moves the province towards its goal of a low-carbon economy. Wind energy ticks all the boxes: it can be built in whatever increments are needed to maintain supply reliability; it is becoming the lowest-cost option available to the province; it does not create smog; it does not contribute to climate change; and it works to reduce the province’s overall carbon emissions. Ontario’s wind industry is ready to help the province achieve its electricity and climate change goals. Want to learn more? Check out these blogs about wind energy in Ontario.